Ease into your Sunday morning with an intelligent and engaging mix of news, in-depth analysis, interviews, weather and what's happening in the arts. Presented by Johanna Nicholson and Josh Szeps, plus sport with Will Davies. 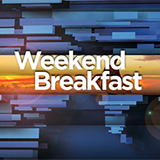 Weekend Breakfast was broadcast on ABC1 at Sunday 10 February 2019, 07:00. Weekend Breakfast is a TV show on Australian national television from ABC1 with an average rating of 3.4 stars by TVCatchUpAustralia.com's visitors. We have 576 episodes of Weekend Breakfast in our archive. The first episode of Weekend Breakfast was broadcast in April, 2019. Did you miss an episode of Weekend Breakfast but don't you wan't that to happen in the future? Please set an alarm and add Weekend Breakfast to your favourites, so we can remind you by email when there's a new episode available to watch. Completely free: handy!